Gwen P. Henshaw, 71, of Jonesboro, went home to be with her Lord and Savior on Saturday, April 16, 2016, at the Flo and Phil Jones Hospice House. Born in Lake City, Gwen lived several years in Bay where she was a 1963 graduate of Bay High School. She lived about 17 years in the Central community of Poinsett County and 20 years in Holly Springs, Mississippi, before moving to Jonesboro in 2007. 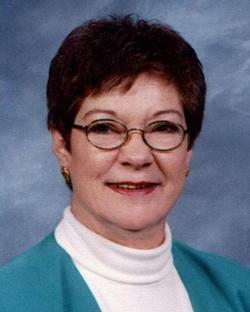 Gwen was an accountant and worked in county government and private business. She was of the Baptist faith and enjoyed crocheting, playing the piano, crossword puzzles and soduku puzzles. Gwen was preceded in death by her parents: Herbert L. and Lina Ardith Vickery Neyman, and by 3 brothers and 5 sisters. 1 brother and 3 sisters. Visitation will be 6:00 -8:00 p.m. Tuesday at Emerson Funeral Home. Funeral services will be held at 1:00 p.m. Wednesday at Emerson Funeral Home with Bro. Glen Hoselton officiating. Burial will follow in Jonesboro Memorial Park. Pallbearers include Chris Secrease, Trevor Burks, Dylan Rowe, Matthew Neyman, Tim Wyse, Terry Nelson and Pete Calvi. "R.H." Robert Harold "Bob" Hinshaw Jr., 67, died Friday, June 18, 2010. He was preceded in death by his parents, Robert Harold and Dorothy Turman Hinshaw. Survivors include his wife, Peggy Hinshaw of Ravenden; daughters, Diane Secrease of Trumann, Sandy Hogan of Jonesboro and Lanna Bradford of Batesville; son, David Hinshaw of Holly Springs, Miss. ; brother, Frankie Hinshaw of Jonesboro; 10 grandchildren; and two great-grandchildren. Funeral services were held in House-Gregg Funeral Home of Walnut Ridge with Larry Loggins officiating. Burial was in Lawrence Memorial Park. Obituary of Robert H. Hinshaw; The Jonesboro Sun, Oct 23 2000. "Jonesboro Sun", Sunday, Jun 20 2010, page A6.